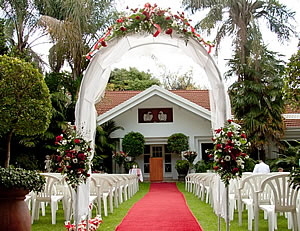 Garden World is the perfect venue for a memorable wedding, and provides various options that include a banquet hall – a subtropical enclosed reception hall surrounding a sparkling indoor pool, with an adjoining rustic bar, beautiful gardens with fairy glens and romantic gazebos for romantic weddings and pictures, an indoor Loft Chapel for cold and rainy days, and a Patio Area that can be draped to your requirements. Banquet Hall and adjoining, fully licensed Wood-finished Bar. 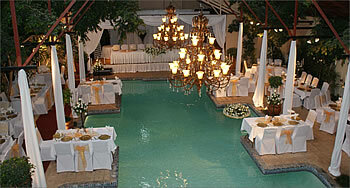 Beautiful Gardens for Garden Weddings & stunning Pictures. Catering: wide selection of menus, also caters for special dietary meals such as Vegetarian, Halaal and Kosher, and Special children’s menus are also available on request.